Plus with baby H around leisurely perusing (be it online or in-store) for thoughtful gifts is pretty much a thing of the past, but on the flip side I do have a lot more time on my hands (during nap times at least) to get creative at home. So I’ve been a busy old bee, making photo books galore, handmade cards and edible delights (of course). I love a good present in a jar, because it’s so easy to make something that looks 1) super profesh, 2) super thoughtful and 3) super tasty. 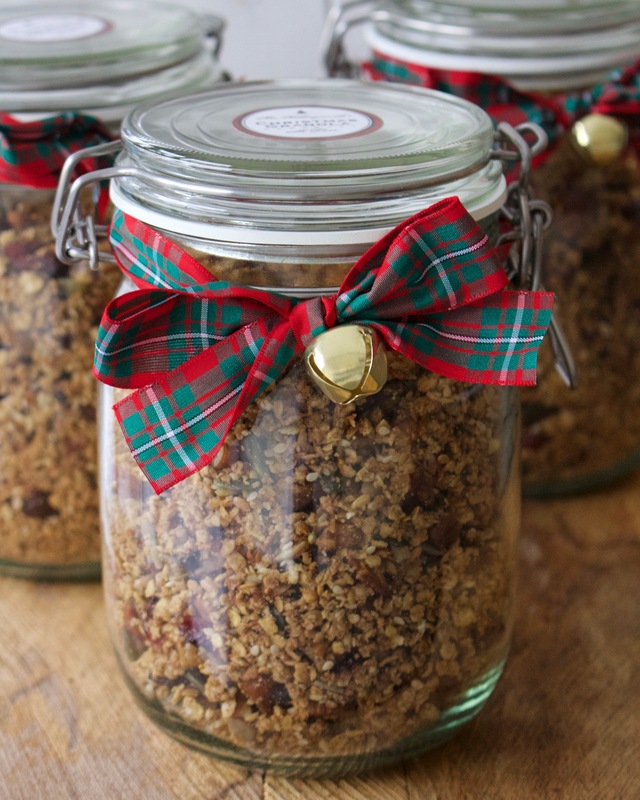 They’re also really economical to make as well, which is great for people like me when you realise you need to buy presents for about a zillion people (Mr H and I both have big families) and the jars are reusable so good on the old carbon footprint there too. This granola is really pretty special. My house smells so amazing at the moment, it’s like someone’s gone around spraying Eau de Christmas everywhere and I have to keep making bigger batches than I need because I always want to keep some aside for myself too, I just can’t face giving it all away! It’s the best holiday season brekkie – sprinkle it onto fruit, have it with milk or yogurt or just nibble on it for a snack. My current fave way to eat it is with stewed apples and coconut yogurt – it’s just heavenly! Preheat your oven to 180 degrees and pop the maple syrup and coconut oil together in a saucepan, place on a low heat and stir until they are totally melted. Then blitz the pecans in a food processor for 20 seconds or so until they are roughly chopped. 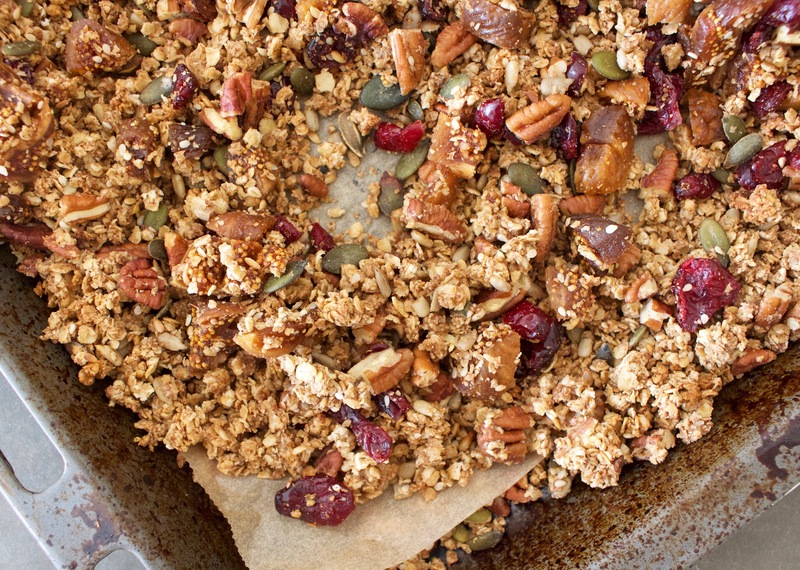 Add all the ingredients into a mixing bowl (NB if you are using dried fruit, simply stir it in after removing the granola from the oven as it may burn otherwise) and once all mixed together spoon the granola onto a lined baking tray. Bake for about 25 minutes, opening the oven to stir every 5 minutes or so so that it bakes evenly and doesn’t burn.